When short-lived, seasonal ingredients that you really enjoy become available, do you feel as though you have to eat them with abandon to get your fill? With many fruits and vegetables, their season is over before we know it and another year must pass until we enjoy them again. Such is the case with rhubarb. 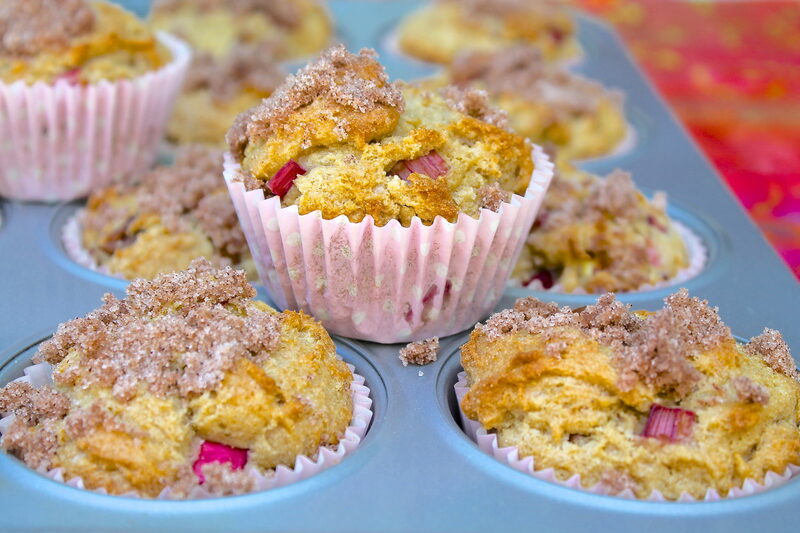 These muffins capture the essence of rhubarb: the tangy-sweet flavor that makes muffins, cakes, crisps and more taste uniquely delicious. They are moist, tender, and easy to whip up. As an added bonus, this batch makes more than the typical dozen. I typically get about 20. Stored in the fridge, they will keep at least a week and may also be frozen. 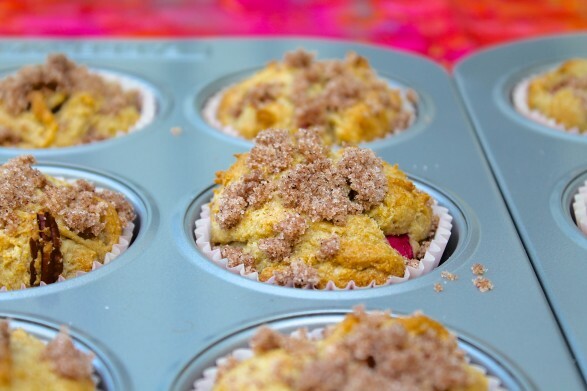 Sweet and tangy with a tender crumb, these muffins are sure to become a seasonal favorite! Preheat the oven to 350 degrees F. Grease a total of 20 muffin cups or line with paper cups. In a medium bowl, stir together the flour(s), baking soda, baking powder, salt, and ginger. In a large bowl, beat the brown sugar, oil, egg, vanilla and buttermilk until smooth. Add the dry ingredients to the wet ingredients and mix by hand until just combined. Stir in the rhubarb and pecans. Spoon the batter into the prepared cups. I like to use a large ice cream scoop to evenly and neatly portion. In a small bowl, stir together the granulated sugar and cinnamon. Mix in the melted coconut oil or butter. Sprinkle about 1/2 teaspoon of this mixture on top of each muffin. I usually start with a spoon and end up using my fingers. Bake in the preheated oven until the muffins are just cooked through, about 17-20 minutes. All ovens vary a bit so check a minute or two early and cook a few minutes longer if needed. Cool in the pans for 5-10 minutes and then remove to a rack and cook completely. When using melted coconut oil or butter, it is helpful to have the cold ingredients come to room temperature before mixing so the oil or butter do not re-harden upon contact. My grandmother froze rhubarb, too, Terra! I have done it on occasion also and it works just fine. I hope you enjoy these muffins when you get some time to bake! It’s hard to come by experienced people, however, you sound like you know what you’re talking about! 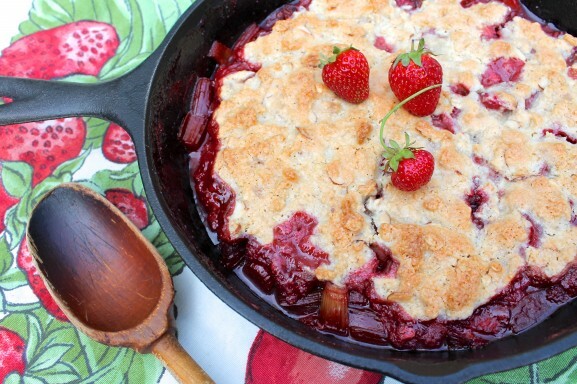 I just came to print this recipe as the first of my rhubarb is almost ready to cut. I’ve been enjoying these muffins for several years now and thought it about time I left a comment. I look forward to these every spring! I’m thrilled you remember these from year to year, Glenn. Thanks for the thoughtful feedback! 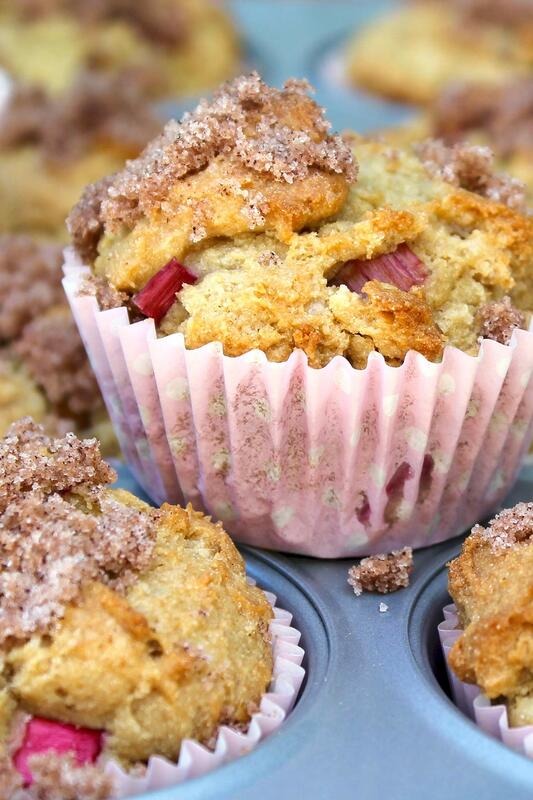 Certified rhubarb lover here to say that these are incredible!